The following is the final report of Mars Desert Research Station (MDRS) Crew 167. A full review of this year's activities at MDRS will be given at the 19th Annual International Mars Society Convention, which will be held September 22-25, 2016 at the Catholic University of America in Washington, D.C. The call for papers can be viewed on the Mars Society web site. 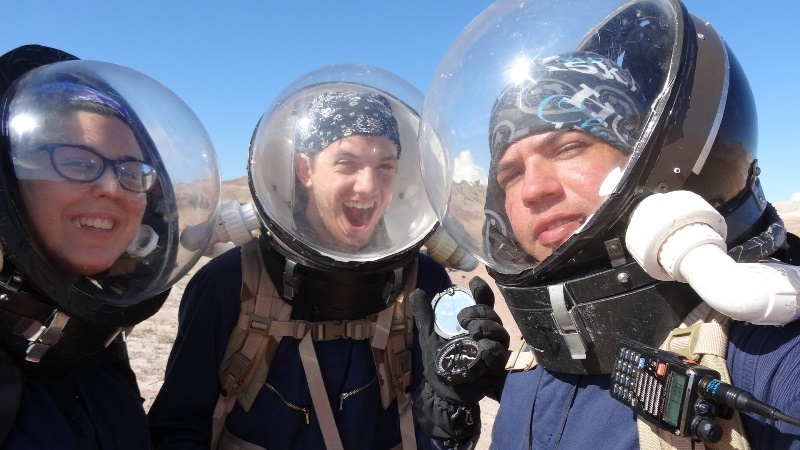 McLennan Community College (TX) sent two crews to the Mars Desert Research Station for one-week rotations, with the goal of providing what we like to call “Mars 101,” an introduction to analog field research and training in all aspects of MDRS sim. Crew 167A of the Lone Star Highlanders enthusiastically took over the Hab on Sunday, April 3. Consisting of faculty members and student researchers, the crew conducted research primarily in biology and engineering design. Crew Astronomer and biology student Dakota Clayton collected soil samples throughout the area in order to perform DNA extraction and isolation with the goal of procuring any fungal DNA present. The DNA fragments will be amplified by Polymerase Chain Reaction (PCR), and then verified by gel electro-phoresis. The results will be sent for sequencing and run through software and online databases to check for known matches. Crew Biologist and biology student Jesse Stanford also collected soil samples, focusing on areas exhibiting signs of moisture. He will use a DNA isolation kit in conjunction with PCR to amplify any presence of cyanobacterial DNA. Crew Engineer and computer engineering student Jonathan Beechner began his first week of recreating a digital scale model of the Hab using Blender, with plans to import the model into Unity 3D and develop interactive elements to help future crews train for sim. Crew Executive Officer and biology student Clark Overman used biometric wearables throughout his rotation in order to collect data related to sleep, stress, heart rate, and other significant variables in order to develop protocols to optimize human performance while in sim. Clark also did a fantastic job as Head Chef, and spent time educating others on the chemistry behind many of his baking projects. Health and Safety Officer, Commander-in-Training, and nursing professor Dr. Amanda Sansom administered to the crew and kept everyone healthy. Crew Commander and engineering professor Dr. April Andreas enjoyed her second rotation at MDRS and continued her previous work on the planned EVAs. Crew 167B arrived at MDRS on Saturday, April 9, 2016, and received the hand-off from Crew 167A. They oriented us well and we settled in to begin our Mars simulation on Sunday, April 10, 2016. Crew Astronomer, Journalist, Commander-in-Training, and chemistry professor Dr. Otsmar Villarroel hoped to observe (and sketch) Jupiter's Galilean Moons transits and occultations and record the time of these events while at MDRS. Although he was able to observe, with a good resolution, the planet and its some of the Galilean Moons, it was not possible to get good images using the DSRL crew camera. Also, problems with the power for the dome and shutter control were reported. Mission support was planning to provide new batteries to remedy the problem but it did not occur during 167B’s stay at MDRS. The Moon and other celestial bodies were observed as well. Crew Engineer and electrical engineering student Jaxom Hartman began his first week of his partnered project with Jonathan Beecher, creating a virtual scale model of the terrain outside the Hab using Sketchup, with plans to import the model into Unity 3D for further development of interactive vehicles and objectives to help future crews prepare before entering sim. The rest of the crew was also immensely grateful for Jaxom’s success as Engineer in resolving some minor plumbing issues at the beginning of the week. Crew Executive Officer, Health and Safety Officer, and McLennan Community College Vice President of Student Success Dr. Drew Canham spent his second rotation at MDRS keeping the crew safe and well, providing guidance and wisdom, and authoring the daily Sol Summaries. Crew Commander and electrical engineering student Karen Rucker, in addition to her leadership project of Optimizing Team Operation in Simulation, enjoyed her second rotation at MDRS and led planned EVAs for Orientation, Geology and Chemistry. The leadership project was supported by a team operating agreement (TOA), team-building activities, and personality profile assessments. Crew Chemist, Head Chef and electrical engineering student Victoria La Barre’s project was designing and building an Emergency Medical Service Rover (EMSR) that would cross the terrain of Mars, locate a distress signal and operate on a patient while returning back to the Hab. Tests were conducted locally at the Hab and at the Gypsum fields. Repairs and adjustments were performed in between tests to better suit the EMSR for Mars terrain. The series of tests proved very beneficial to the EMSR’s development and Victoria plans to continue improving its design when she returns home. Jonathan Beechner continued his research with crew 167B as Crew Geologist and Greenhab Officer. He had surprising success in sprouting tomatoes in the temporary Greenhab; he also maintained green onions and radishes. He nearly finished his 3D model of the Hab and plans to import it into Unity3D when he returns home. On Tuesday, April 12, Crew 167B had a visit from Neil Schwartz and Dr. Joe Mascaro of the San Francisco Film Society. They interviewed the crew and filmed footage of our life at the Hab and of suiting up for EVAs. Both crews 167A and 167B worked together well during their respective weeks in simulation. The food studies are not in progress and therefore, the crew did have a few fresh food items, but other than that, all meals were from the shelf stable supply already provided. Everyone was very satisfied with the taste of these meals. On Saturday, April 15, 2016, our rotation ended and we handed over the Hab to the volunteer work crew. The valuable and unique experiences and challenges of the time here at MDRS have allowed crew members to grow, both personally and as researchers. We would like to thank the Mars Society for this invaluable experience and their support during our rotation. We are deeply grateful for the opportunity.